BrightStar Wisconsin Foundation announces new flexibility for donor's to direct contributions into UW-Madison related companies. Read more about BrightStar Wisconsin Foundation announces new flexibility for donor's to direct contributions into UW-Madison related companies. MILWAUKEE, May 5, 2014 – The BrightStar Wisconsin Foundation Inc.
for three additional early-stage Wisconsin companies. based in Madison and building its production facility in Spring Green, Wis.
With a fresh nonprofit designation in hand, BrightStar Wisconsin Foundation Inc. has deployed its first three investments in startup companies that will create jobs in Wisconsin. 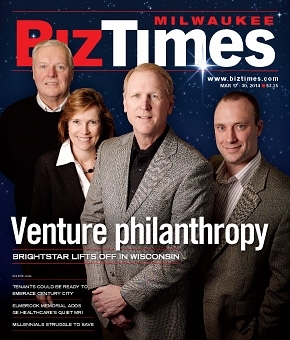 BrightStar Wisconsin Foundation Inc., a new group with an unusual plan for using charitable donations to make venture investments in young state companies, has received federal approval to operate as a tax-exempt organization. The Internal Revenue Service approval announced Monday paves the way for BrightStar to start investing $7 million already pledged by donors and begin raising more, said Tom Shannon, the foundation's president. MILWAUKEE, Nov. 14, 2013 – The Wisconsin BrightStar Foundation today announced that former Wisconsin Department of Financial Institutions Secretary Lorrie Heinemann will join the foundation as vice president. Ms. Heinemann will head the foundation’s new Madison office, which will have statewide reach. As state capital for early-stage companies has continued to plummet in Wisconsin over the past two years, now down to about $25 million, a new nonprofit organization has taken the first steps of a revolutionary approach that it hopes will fill the financial gap to fuel job growth and business development. Milwaukee-based BrightStar Wisconsin Foundation, which was incorporated July 1, is turning to the state's pool of philanthropic individuals and foundations and asking them to donate a portion of their pockets to state-based startup companies. Zilber Property Group will provide rent-free space for BrightStar Wisconsin Foundation in the Milwaukee office building where the real estate developer has its headquarters. "This contribution by the Zilber Property Group will allow us to direct an even higher percentage of donor dollars to our mission of investing in early-stage companies to fuel job creation," said Jeff Harris, BrightStar's co-founder and chairman.